Present-day Mars is a cold and dry planet with less than 1 percent of Earth's atmospheric pressure at the surface. However, many geological features indicate the planet had an active hydrological cycle about 3 to 4 billion years ago. An active hydrological cycle would have required a warmer climate in the planet's early history and therefore a thicker atmosphere, one capable of creating a strong greenhouse effect. If the solar wind did not strip Mars' atmosphere, then we are left with the question of how Mars lost its early atmosphere. 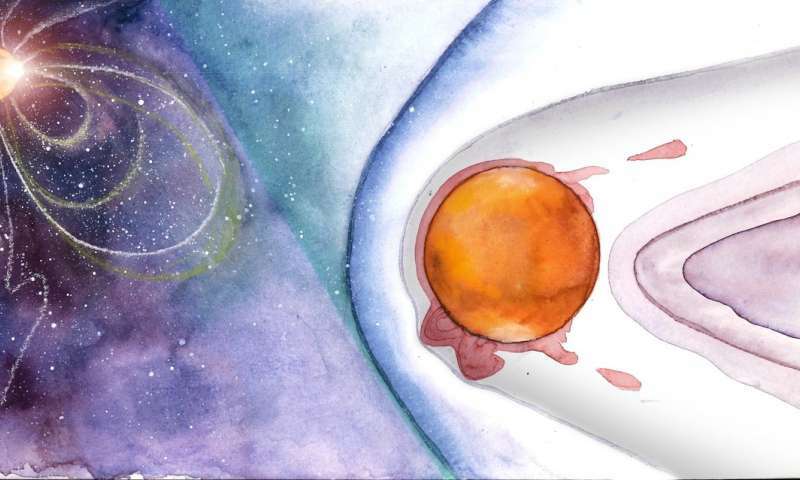 There is evidence that Mars collided with a very large mass at in its past. Could such a collision have stripped the atmosphere? "If the solar wind did not strip Mars' atmosphere, then we are left with the question of how Mars lost its early atmosphere." "However, many geological features indicate the planet had an active hydrological cycle about 3 to 4 billion years ago." Assumption again. The geological features may well have been from electrical/plasma causes, and much more recently than is believed. Mainstream of course can not ever admit to one incidence of electrical/plasma surface modification on even one planet or moon as it would negate all presently held beliefs. Assumption again. The geological features may well have been from electrical/plasma causes, and much more recently than is believed. Complete nonsense. Please show the theory behind this. Lol - it'll be Velikovsky, as usual!. Nothing to do with science, therefore. Which is why you won't see any serious scientist promoting such idiotic woo. Well, here is my take on it - after formation, there was a lot of heat around to drive volcanism. This released large amounts of GH gases (i.e. water & CO2) to the atmosphere. As there was water vapour around, then one assumes there was rain to wash the CO2 out of the atmosphere, as on Earth. Unlike Earth, there was no plate tectonics to recycle that carbon. However, as long as it was replenished from volcanism, it would stay warm enough. Once the heat dissipated, and volcanism died out, then the carbon was all sequestered in rocks, and the water was frozen out below surface mainly. So, if this thesis is correct, then the bulk of the ancient martian atmosphere must still be there, albeit in solid form. jd, I agree with your supposition until your final conclusion that water ices are still there. Beneath the surface, protected by the sands covering it. Here on Earth, high deserts are notorious for dryer than dry. Even on this water world Earth, there is constant evaporation from the ground layer. On Mars? Over billions of years of near vacuum? Desiccation does not even begin to describe how Mars lost it's hydrosphere. Until further evidence is gathered and verified? I do not believe we will discover even deeply buried aquifers. To respond to the thread, there is repeated argon isotope measurement showing massive atmosphere loss as well as Curiosity observation demanding an active hydrological cycle. (And of course the suddenly juxtaposed pseudoscience cannot explain *anything*, or it would not be known as futile pseudoscience.) And there is evidence of massive amounts of buried ice from satellite and Phoenix' observations. jonesdavid's hypothesis is both reasonable and well correlated with recent "warm volcanism" hypotheses explaining flood and clay deposits as results of dominantly high pressure CO2 rather than CO2/H2O episodes. Though the carbonate burial is up in the air, some geologists claims evidence is lacking, some AFAIK that there are impact areas with evidence of it from literary kilometers down below the lava plates. tb_b_g_l, the problem I am having with your supposition is two-fold. If I am misunderstanding you? Please feel free to correct me. I know that I am as error-prone as everyone else. First, it appears to me that you are not including the span of time. The billions of years since Mars experienced internally-driven tectonic activity and had a hydrosphere. Second, I am not seeing inclusion of billions of years of bombardment by rock and ice. If any water is found on Mars? It will test out as remnants of cometary materials. The Earth has the advantage over Mars, as being just a little further away from the largest congregations of asteroids. In addition to having our giant Moon as a shield. In a Universe of fundamental uncertainty and perverse structural randomness. I think it is unrealistic for us to insist that every other planet has to mirror Earth's development. Honestly? We are just plain spoiled by our home world and the munificence of this biosphere. I agree. From what the article says is the date for loss of hydrology, it'd been solid enough to blast it all out w/out a strong m-field. Since the multiple moons indicates a large impact. But, it would've had to happen before it was too solidified or it would not have rounded back out. Good observation. The math is more complicated.